I arrived home in one piece. My flight from SFO to Manchester, via Zurich, was without incident - very smooth and painless. Now that I am home, I am in a state of amazement. I have experienced better weather here in the past four days than all of 2019 in California and I have loved every minute of it. Thing is, England is hard to beat when the sun is shining, it is just so pretty. And so green. Spring has always been my favourite season in Blighty. Family OTW and I have busied ourselves with lots of activities; shooting, archery, bingo and other games. Every meal has been outside, breakfasts, lunches and dinners. Of note, yet another fabulous wood-fired pizza event (my sister-in-law's Thai chicken pizza could give California Pizza Kitchen a run for their money) at which I discovered that a particularly spicy pizza paired well with a Prosecco that Thud pulled out of his wine-stash. Fun. 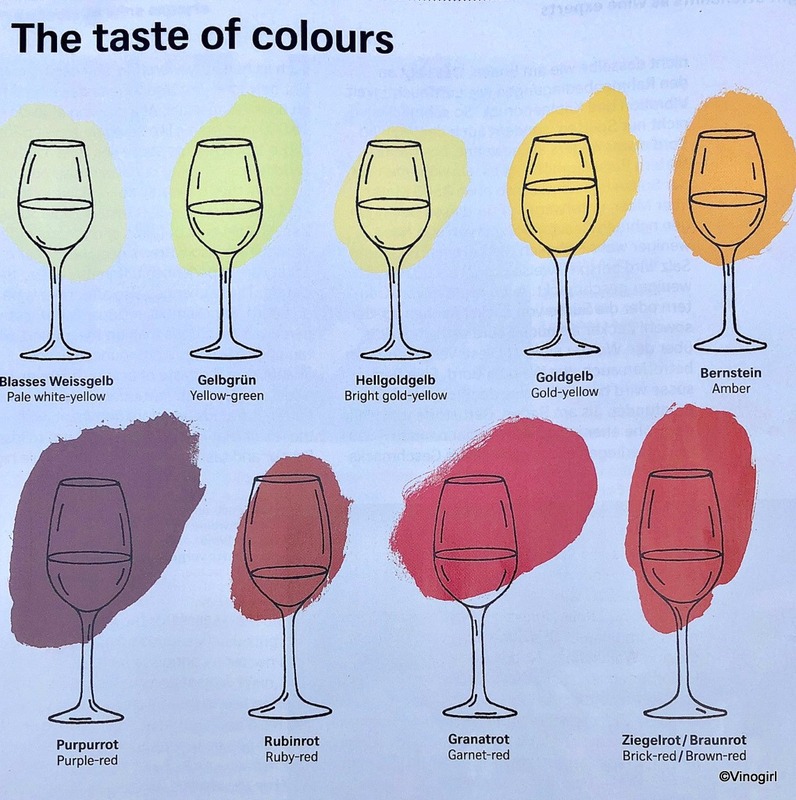 The Taste of Colours, kindly reproduced with the permission of Swiss Air (well, I'm sure they would have approved it if I'd asked), is not about the neurological trait synaesthesia. 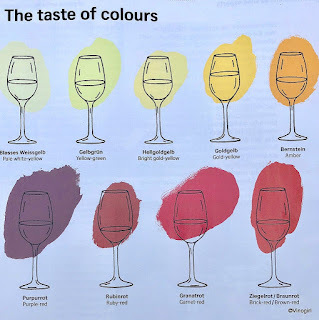 Rather, the wine-article in my seat-pocket magazine maintained that there was a correlation between the colour of a wine and the way in which a wine is produced, even a vintage's growing conditions, with the qualities therefore inherent in a wine. Not sure I totally buy the whole premise of the article as it's a little simplistic, besides I don't read German, but it made for some light, in-flight entertainment - a bit like the colour, Blasses Weissgelb. ...to where I once belonged, Part 14. Yes, this evening I will be winging my way back home to Blighty, hopefully with a glass of Swiss Air white wine in my hand. Chasselas to be exact. In preparation for my journey, I did a bit of research (wine research, my favourite) and drank a bottle os Swiss wine. I even let Vinomaker have a little. The 2017 Cave de La Côte, Chasselas Romand was an extremely quaffable, light wine. Fresh and airy, with an aroma of lime and flowers, followed by lemon and melon on the palate this was a very nice Chasselas. I remember years ago driving past the vineyards in the canton of Valais (around Sion). Little did I imagine that years later I would be sitting in the Napa Valley drinking a bottle of Swiss wine from the Upper Rhône Valley. Life is funny. A little bit later than last year, but no too much, the Cabernet sauvignon vines are beginning to go through budbreak. That's it, all of Vinoland's vines now have some green-stuff going on. In fact, the white grapes are at the stage were I need to start suckering the trunks. It's always something. This is not a post about a food and wine pairing. No, it is a post about the incessant rain that northern California is experiencing and the fact that I don't like it. However, a neighbouring vineyard's cover crop is enjoying it immensely. Every cloud has a silver lining, or something like that. It has rained every day this week, PPTHHPTHPFFTHPPPT!!! The weeds, like this purple dead-nettle (Lamium purpurem), are loving the rain, whilst me, and Vinodog 2, not so much. At least I have something pretty to look at, as I walk around with my head constantly bowed to avoid the raindrops. Sigh. I'm pooped, but I am finished with pruning (at 4.26 pm, to be exact). Hallelujah! It was a tough year, the rain has been incredible, this is the latest date ever that pruning has continued in Vinoland. I don't normally drink on Sundays, but the end of pruning always calls for a bit of a celebration. I opened a bottle of something Vinomaker had given me on my birthday. Another Crémant D'Alsace, the Emile Boeckel Brut Rosé is a delightful wine - right down to the simulated pink leather label (complete with faux silver stitching). Quite pink, rather fizzy, very tasty. Love it! A second reason to have a glass of bubbles (as if I needed one) is that it was Mother's Day in England today, so cheers to my Vinomum. Phew. I'll sleep well tonight. It was a gorgeous day today, finally. Beautiful blue sky, a few white fluffy clouds, temperature reached 66° F. I managed to get quite a bit of pruning done. Yay! When, at 5.10 pm, I finished pruning for the day it started to rain - just as Vinodog 2 and I were going on our afternoon walk, of course. With just one gigantic, dark grey cloud over Vinoland the rain did not last for long, thankfully. The weekend forecast is promising. Of course with clear, cloud-free spring nights comes freezing overnight temperatures and frosty mornings. 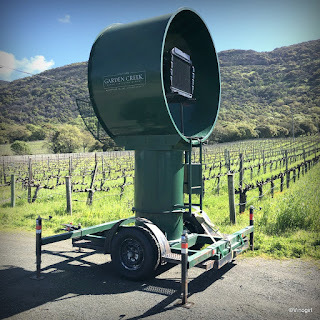 A neighbouring vineyard, Farella Vineyards, is preparing for such an eventuality. (As an aside, I love this portable fan.) It can be a bit of a battle, as frosts may or may not occur this time of year. 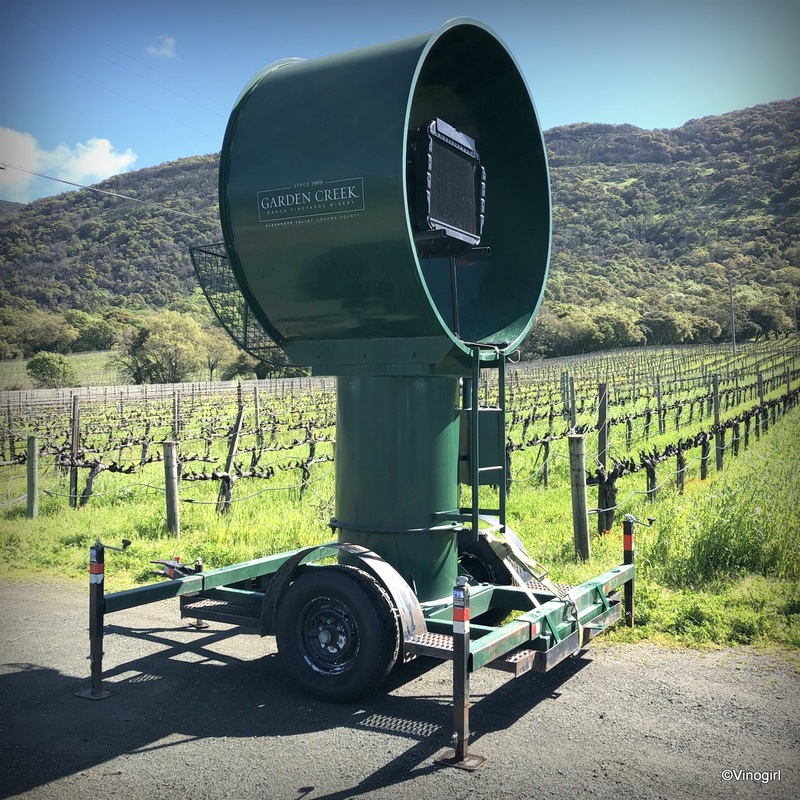 However, commercial vineyards need to be armed with preventative measures to ensure that the vines are protected from injury. It's always something with Mother Nature. I can honestly say that I have a new found appreciation for England's farmers, or rather how difficult it must be for them to grow or raise anything in the often calamitous English climate. I myself am having a bit of difficulty farming here in, currently, not-so-sunny California. I managed to get out into the vineyard quite early this morning and it was actually a little sunny. However, I made the mistake of stopping for a cup of tea at 11.00 am and consequently wasted some valuable outside-time. When I returned to the vineyard I barely managed to get in another 40 minutes of pruning before the heavens opened. Determined to be finished pruning by this coming Sunday, I was hoping the weather would cooperate with me over the next four days, but nope. This afternoon, for the 3.00 pm hour, lightning was forecast. What? There was no way I wanted to be caught out in the vineyard with long metal loppers in my hands in lightning. The lightning didn't materialise, not that it mattered, I was stuck indoors anyway. The weather forecasts have been very changeable of late - as in they have been literally changing every 4 to 6 hours - and I don't know whether I am coming or going. Neither does the rain. Sigh. At this rate I may have to ask Vinomaker if he has a headlamp I can borrow and some skunk repellent I can arm myself with, as I may have to resort to a bit of catch up nocturnal-farming. Today was a bust, oh well. One down, three to go. My hopes of getting out into the vineyard Friday, for a little while at least, were dashed by a constant downpour that just got heavier and heavier as the day progressed. Yesterday was a different matter. Absolutely gorgeous sunshine meant that I was able to get out into the vineyard and get some pruning done. Also, Vinodog 2 and I had a lovely mid-afternoon walk, always a better event when the two of us don't get drenched, and on the walk I discovered yet another new wildflower. I first noticed several Mule-ears (Wyethia glabra), growing here and there a couple of weeks ago, due to their rather conspicuous burdock-like, lance-shaped leaves, but I had no idea what they were. Now, however, they are flowering and the beautiful, vivid yellow blooms are extremely cheery looking. Still, it took me a while to identify the Mule-ears as at first I thought they might have simply been wild sunflowers, but in researching sunflowers, wild or cultivated, I came up with nothing that resembled my neighbourhood-native. But I persisted and finally identified the Wyethia glabra, a member of the Asteraceae family, as my new floral-find. So I'm happy to report, well, that I'm happy with my discovery. It's my birthday and the fact that it is raining hasn't dampened my enthusiasm any. Seeing as I already had my wellies on, after my and V2's morning walk, I had a quick glance at the Syrah vines to see if anything was going on. Yes indeedy, bud break is happening - finishing pruning the Syrah this past Sunday wasn't a moment too soon. Of course, the rain means that I won't be getting much done out in the vineyard today. I am, however, determined to tie down the Cabernet vines I pruned yesterday. So I'll don my rain jacket and hopefully not get too soggy wrestling with the wet canes, but other than that it is just too wet to get any actual pruning done. I always try to be finished pruning by my birthday, but Mother Nature hasn't cooperated with my plans this year. Sigh. I recently got to partake in the tasting of a 1982 Groth Cabernet Sauvignon. And it was stupendous, probably one of the nicest wines I have ever tasted. Stunning, really stunning. In October of 1982, the young Vinogirl had just started college: the vineyard workers at Groth had just started to harvest the Cabernet sauvignon grapes that went into this wine. Hard to believe that what I was drinking was a 36 year old vintage. Whilst I got a lovely, crazily nuanced strawberry jam vibe from the '82 (acid was sublime), the tablemate, to my right, got plum jam. The tablemate to my left wouldn't stop drinking long enough to comment - can't say I blame him. It is fitting that I post about Cabernet Sauvignon this evening, as I started to prune Vinoland's Cabernet vines today. It's a little distressing to me that I am only just getting started, I usually set myself a goal of being finished with pruning by the 22nd of March. That is not going to be the case this year. However, I must keep calm and prune on. Panic! Gorgeous weather yesterday and today, so I was lucky enough to get quite a bit of pruning done. However, I am still really behind because of all the rain we have been having. (Panic?) But today, I was able to finish pruning the Syrah vines and I got them all tied down. Phew, what a relief. I did have one teensy-weensy hiccup, though: I ran out of twist ties. Vinomaker had gone out and I had no idea where he kept our supply of ties. Then I remembered that I had bought a bunch of asparagus yesterday and it had a couple of ties on it. Voila! Recycling at its finest. So Happy Finished-Pruning-Syrah Day, or Happy St. Patrick's Day, whichever celebration one prefers. I'm going with the former. I attended a retirement luncheon today and although it was a happy occasion - the celebration of a job well done for 37 years - it did, however, cause me to pause and reflect on a few things. Things like, let's see, the passage of time, the comings and goings in life of friends and family, and the fact that nothing stays the same forever. Including wine. A score of years has passed between the vintages that produced these two wines: Groth Vineyards & Winery's 1996 and 2016 Chardonnay, Napa Valley AVA. (Of course, if I had one bottle to represent each year in this particular span of time I'd have 21 bottles of wine. Two will do.) Drinking these two wines, side by side, just seemed fitting considering my mood. The 1996 was still a beautiful wine, golden in colour with a honeyed-apricot jam thing on the nose. (I'm thinking the 1996 will be good for a couple more years, at least.) I just wish it had been a tad more crisp. The 2016, however, was very crisp and vibrant with a lovely apple-limey-pineapple mouth-filling complexity. Chardonnay is not my favourite wine varietal, but when it is done well it can be quite fascinating. Although not fascinating enough to get in the way of my navel-gazing. Apparently, there is no room for discussion, the table grapes are leafing out. Bud break is happening in all three varieties of the only grapes in Vinoland that don't go into making wine; July Muscat, Crimson Seedless and, pictured here, Red Globe. We are having rather nice weather at the moment, so I'm expecting them to go crazy this coming week. Leaf away, little fellas. Illuminated in a rare (this winter) ray of sunlight, this pretty Pacific hound's tongue (Cynoglossum grande) adds a very noticeable and welcome pop of colour to all the greenery that currently is soggy-California. A member of the borage family, I had first spotted this particular wildflower a year ago, but was too busy, distracted, preoccupied, dog-tired (pick one) to take the time to identify it. As with the shooting stars, this wildflower was identified for me by the Marketing Queen. Thank you MQ! I just love any blue flower. Seeing as I was out and about with my camera, photographing the aforementioned shooting stars, I thought I'd get a quick snap of the hound's tongue too. Geek's do stuff like that.